Is your business visible from the main road or located in a strip mall? Well Window graphics can be the solution to capturing the attention of new and existing customers to your brand with a vibrant and colorful window graphic on your storefront. Window graphics can cover the entire length and width of your storefront or be strategically placed on the front of the business leaving the door front clear with maybe a small posting graphic on the door of your business with your hours of operation. Window graphics are easier to see from the road and give your customer more time to capture the essence of your store through the use of a colorful graphic, branding and words. 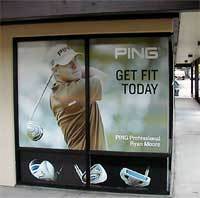 Window graphics can be installed using window perf or vinyl. The choice is yours. Window perf gives a vibrant print but allows you to see out of your storefront while your customer only sees a vibrant graphic during day light hours. This can also cut down on the cost to cool your operation as the window perf will shield your establishment from many of the harsh rays of the sun. Your graphic will also appear vibrant at night using window perf, but a less opaque as the suns rays are not there to reflect off the window perf treatment. The alternative to window perf is to use vinly which will be even more vibrant, due to the opaque nature of the material. Vinyl on the windows can increase display space inside your business along your front display windows as the customer looking in will only see your vibrant graphic and you indoor customers will only see your fabulous displays. This will also cut your cooling expenses as vinyl material will block all of the suns rays into your business. Window graphics are durable and will not damage your windows even if the graphic has been on the windows for years. All installations are performed on your business site. Call 301.218.8337 to make an appointment for an onsite installation consultation. REMEMBER THE COST OF NOT ADVERTISING FAR OUTWEIGHS THE COST OF INVESTING IN YOUR BUSINESS. IT CAN BE THE DIFFERENCE BETWEEN YOUR BUSINESS FLOUNDERING AND FAILING COMPAIRED TO SOARING TO NEW HEIGHTS IN SALES. Wall graphics are a great way to brand your business office, store and even to add dimension to a room in the home via the use of three-dimensional graphics. 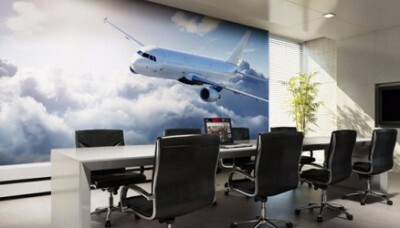 Wall graphics in a business office can add interest or engagement in a waiting room. For instance, instead of paying for an oil painting on the wall you could cover half of the wall behind the receptionist with your corporate logo or an interesting print on an adjacent wall from ceiling to floor. Wall graphics can be used for a museum type effect by displaying a graphic with text to describe the history of the picture using creative word art. In a children's waiting room, wall graphics can be used on one wall or all walls depicting children engaged in various activities like sports, playing outside, working in class etc using a cartoon type graphic or it can be tailored for the type of customer your clinic or Dr's office caters. In the home, a wall can be covered with a three-dimensional picture to add depth to a room and create a tranquil environment. it can also be used in a child's room by using a high-resolution digital picture of your child in their uniform on the field or on the court to display their interests and make them feel bigger than life. wall graphics last up to 5 years at which time we recommend removal and reinstallation to preserve the integrity of the paint on the wall.